Printed Mailer Invitation for national distribution to Nordstrom Rack Rewards members. This project was completed while working as a production artist for Nordstrom Rack's holiday season. This and other promotional materials for this Holiday Points Party, was the only project I was given license to create new art for, while the rest of the Holiday promotional material had a previously designed elements from an agency we were tasked to repurpose into various formats. Polka dots/circles are the Rack's main design element, so I played around with those and combined colors from the holiday palette with those of the Rack's regular palette to make a decorative festive visual theme. For the printing process I worked closely with our vendors and created a custom die-cut to accommodate the interior pop-up. Door sign, freestanding inside store door, promoting event. 2014 Holiday Shopping Bag. Was given the task of designing the bag distributed nationally to all Rack stores during holiday season, using the tag and ribbon design used throughout all holiday materials. Specifically it was meant to pair with the that year's holiday gift card featured at right. I worked directly with the vendor on this project to cater design for best production standards and problem solve marketing teams needs to align with their requirements. Promotional materials for Seattle Artisan Ice-Pop company. 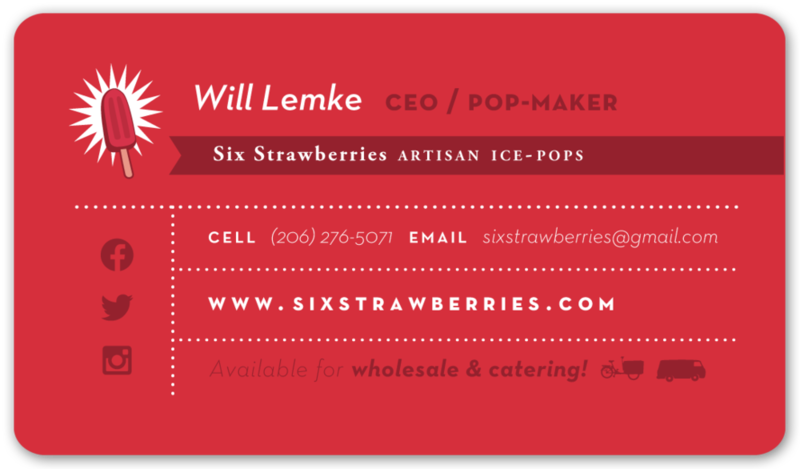 In our effort to increase the company's wholesale and catering business we created these business cards and pamplets to handout during in-store tastings and to any inquiring customers. The pamphlet was an idea I came up with to better inform the customer about all the ways the company is unique, since they had such unique selling points and I felt the best way to present all that info in a way that would be best absorbed, I could create some fun infographics that illustrate the concepts and keep the brand style themes of fun and quality. For more projects with this brand see painted sign art, chalk sign art and logos. 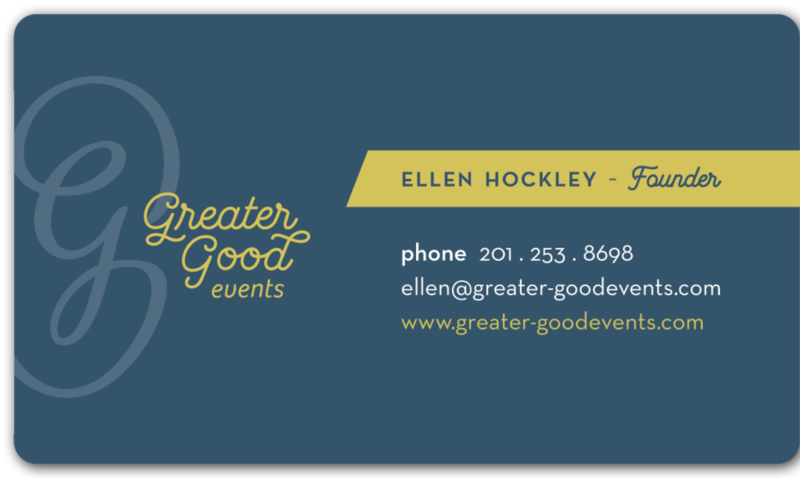 Business Cards for Event company focusing on local and sustainable events in the New York area. For these we wanted something beautiful while modern and appealing across multiple genres of customer. I used a vibrant color to be memorable and balanced it with a muted color to stay sophisticated. For more projects with this brand see logos. Business cards and punch card for neighborhood bakery. With these promotional cards went for a rustic wood tone with white and brown to match with the style of the bakery which includes a lot of wood and a clean & modern yet down home feel, with nods to the sod house namesake. For more projects with this brand see logos. Amy and Matt, being both practically minded biologists and well as adventurous urban 29-year-olds, wanted their invite to be functional as well as cool, so they came up with the idea of their invite being a poster. That way it could be hung as art and used as an informational piece, including a map for relatives coming from out of town. Because their wedding, where their guests were staying and where they lived were all within the same quirky neighborhood of Seattle called Fremont, we decided to make this neighborhood the theme of invite. This neighborhood has traditionally been an artsy, odd place, even giving themselves the title of "the Center of the Universe" so I decided to play on that theme, as well as their science backgrounds and give it a slightly "spacey" aesthetic. The map also doubled as a walking guide for the neighborhood pinpointing the odd art pieces around town that could be seen, as well as the various ways to get to the venue via car, bike and bus. The end result became a fold out letter-sized page that could be compacted into traditional wedding envelopes along with various colored RSVP postcards, that incorporated the other wedding colors and could be recycled into wedding decorations. See below for what we created! Promotional materials for rebrand of neighborhood breakfast/lunch restaurants specializing in sweet and savory crepes. The Ridgeback is also converting into a natural foods market so they needed advertisement for the change-over as well as new branding. Included in collateral package was postcard handouts, business cards and merchandise. For more projects with this brand see interactive design, painted sign art, chalk sign art and logos. A gourmet biscuit/breakfast restaurant partnered with a coffeeshop sharing the same space and vision. I worked with them to develop a brand for both businesses and keep that brand consistent throughout with print materials, signage and packaging. Look in Logos, Packaging, Chalk Sign Art and Painted Sign Art for more of this brand. Specailty coffee truck owned by ZOKA coffee roaster, offering unique & well crafted treats. Developed logo from clients concept, incorporating the waterfront location and retro styling inspired by being established inside 50's milk truck. Look in Logos, Interactive Design and Painted Sign Art for more of this brand, or go to www.celestoespresso.com for more about the business. While working at Q&A it became my responsibility to design and plan our annual company party, that was themed around the Chinese New Year as an alternative to Christmas. This allowed for the fun and exciting subject matter of the animal of the year. In 2009 it was the year of the Ox, and I explored this theme while incorporating our company's hand-drawn aesthetic and my own love of illustrated typography. The illustration demonstrated and described the animal/year's characteristics in a fun playful manner while being careful to keep information clear and structured. This design for Q&A's opening/holiday party was my first opportunity for the company to design whatever I wanted, so I had a lot of fun bringing in my illustration skills in accordance with the company's hand-drawn crayon aesthetic, fonts and the Chinese New Year theme. That year the Rat was the star of the show, so the image and the virtues of the rat were brought in with hints to the party theme and holiday standards. The main idea was to keep things fun and the information clear, in a way that maximized excitement and attendance, which was very effective. Letterhead and Envelope design for Entrepreneur's Organization of Seattle, using company branding. Their style is clean and modern so I kept with that feel to create stationary that would help them stand out and look proffessional to their recipients. Photography studio specializing in hip, unique photography for weddings and portraits. I developed a new brand for the client featuring a logo, stationary, cards and a promotional booklet advertising features and pricing. For more with this brand visit the logos and interactive design sections.